Perplexed, that’s what I am. 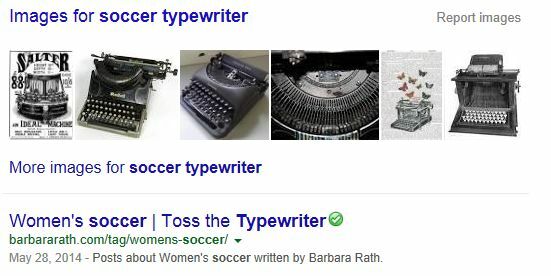 Why would anyone put the words “soccer typewriter” into a search engine. Yet someone did. I have proof. Even more mystifying is that these words lead directly to my blog. Toss the Typewriter gets top billing on Google, and is in Bing’s and Yahoo’s top five. I am puzzled as to why that same person, would actually click on the link, which again I can clearly see that he did. And that’s when my over-reacting, worrying brain kicks in. Google says that there are “Posts about Women’s soccer”; not A post, but posts. I must write more posts. NOW! Otherwise I will disappoint this wonderful reader. Not only that, but it specifically says women’s soccer. I must write about women’s soccer, I think. Otherwise I’m not meeting expectations. Luckily, I do want to talk a bit about soccer: both women’s and mens soccer. Let’s start with the women. But first, if you are looking for news about Hope Solo’s domestic violence arrest, look elsewhere. I’ll leave that to the tabloids. I want to talk briefly about the upcoming Boston Breakers/Western NY Flash game on Friday night. This match-up is one of my favorites, as it is a battle of my hometowns. Boston Breakers are my current hometown and generally the team I follow. But when they play Western NY Flash in my childhood hometown and they face hometown-hero Abby Wambach, my loyalties are split. I’m guessing Wambach will take the pitch in front of her hometown crowd, and because of that I have to give the edge to Western NY. Then there are the men. They have toned down the theatrical falling all over the place, which by the way, Brazil’s women perfected in the 2011 World Cup. But the men’s games continue to be brutally played. Clint Dempsey (USA) has been playing masterfully despite a broken nose received in the match-up against Ghana. Italy, took a licking (or a biting) from Uruguay, and are now headed home. Also headed home, to my dismay, is Spain. Their elegant, excellent play in 2010 led to a World Cup victory. It’s disappointing to know that their passing, patient game will be missing from the quarterfinals. And then there is the USA. They fought past Ghana for a 2-1 win. Then in game two’s battle against Portugal they were within seconds of clinching a spot in the quarterfinals when Portugal scored the equalizer. With that 2-2 tie, the US stays in the running for the quarterfinals, but they chose a rockier path to securing a spot. Tomorrow they play Germany (Noon EST), but this already difficult game will be played without injured forward Jose Altidore. Both Germany and the US can advance with either a win or a tie, but Germany is a tough foe and not likely to let the US outplay them. If Germany and the USA tie, USA’s advancement will be at the mercy of the Ghana vs Portugal game results. Phew. I feel so much better. Now anyone can type “Soccer Typewriter” into a search engine, connect to Toss the Typewriter, and get not one, but two soccer articles. I can rest now, for I have done my job. This entry was posted in NWSL (Soccer), Weekly Brief and tagged Abby Wambach, Boston Breakers, Client Dempsey, Jose Altidore, Soccer, World Cup 2014. Bookmark the permalink. It’s amazing what is typed into search engines, isn’t it? Great post! Thank you for taking the time to stop by and to comment. Thank goodness! I’m so relieved!! Ha! Thanks for making me laugh first thing in the morning!